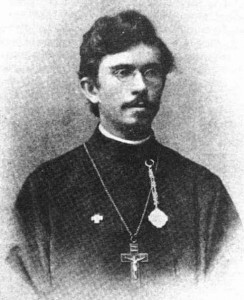 St. Alexander Hotovitzky was the rector of St. Nicholas Church (and then Cathedral) in New York City from his ordination in 1896 until his return to Russia in 1914. For almost all of that time, he was the highest-ranking priest in the Russian Mission. Of course, he was dean of the diocesan cathedral, but he traveled a great deal, ministering to Orthodox people all over the Northeast. He was also editor of the Vestnik (the official diocesan magazine). In the study of Rev. Alexander A. Hotovitzky, Archpriest of the church of St. Nicholas, the chief adornment is a large picture of Father John bearing his autograph. This was presented to Father Hotovitzky last Summer when, during a visit to Russia, he called upon Father John to thank him for the interest he had taken in his little flock. A portion of the funds necessary for the erection of the handsome new church edifice was collected in Russia, and Father John both by personal donations and by enlisting the interest of others in the cause became a substantial contributor. The visit of Father Hotovitzky to Cronstadt [sic] occurred on July 19 (old style). It so happened that this was Father John’s name day. Faithful to a custom of many years, the Russian divine on that day celebrated a solemn mass in the cathedral and then entertained at dinner the many friends who had come to extend their good wishes. The Rev. Father Hotovitzky was one of the guests. “Vice Admiral Marakoff was toast-master at the dinner,” said Father Hotovitzky yesterday. “It was only natural that he should be, for he and Father John are bound together by ties of warm personal friendship. There were present at that dinner many dignitaries of Church and State, but, nevertheless, it was a most democratic affair. Father John has some quaint notions, and even in a land of such marked class distinction as Russia, rich terms of equality. It was a good dinner, and good things to drink went with it, for Father John, though ordinarily he lives as frugally and abstemiously as a monk, believes that God put the good things of life on earth for the cheer of man, and he loves to see others enjoy themselves. “Father John in some respects is the most remarkable man in Russia to-day, and certainly is the most talked of. He represents a type all by itself in the Russian Church, and no one has so vividly brought home to the people its power and potentialities with a complete leaving out of all the ostentation, pomp, and grandeur with which it formerly charmed and awed the people. “Those who have been wont to consider Father John as a mystic or as a man of a monastic cast of mind have erred. He is the opposite. He took a wife, and he mingles freely in the common life of the people, and he enjoys a good joke. He has secularized religion and both by life and teaching has steadily striven to lift the common life to the level of religion. He is a strong advocate of the living help, and he turned his back on monastic orders just because he felt he was needed and could be a potent influence for good by remaining in the open life where those that needed him could constantly besiege the doors of his simple dwelling in Cronstadt when he is there and the crowds that gather at railroad stations during his many journeys through Russia which occupy the greater part of his time have shown that he was right. “His influence reaches from the throne of the Czar to the meanest hovel in Russia. He takes from the abundance of the rich with both hands and scatters it as freely among those that need it. It is only through the remarkable gifts he receives that he has been able to maintain something like twenty-five asylums and institutions in different parts of Russia, of which he is the founder. “One charm about Father John is his broadness. While orthodox in the essential meaning of that word, he makes no distinction between those that follow his and other beliefs. He bestows his blessing on all alike, for he recognizes as divine every channel through which a devout spirit and a realization of the highest life can flow into the human soul. “In his study you will find a desk, a bed and some holy pictures. It is as simple as the cell of a monk. He spends little time there, however, for his time is mostly taken up with relieving suffering among the poor, comforting the dying, and on missionary journeys. Were a call to attend a deathbed at the other end of the empire to reach Father John in the middle of the night he would rise and take the first train. Further along in the article, the author (not St. Alexander) tells this story, which, while not really relevant to American Orthodox history, is still so good that I have to print it here. Whether it was answered or not is not known. But when the Czar was dying in Crimea an urgent call was sent to Father John, and he was rushed across Russia on an imperial special [train] to the bedside of the monarch. It’s hard to imagine something like this in a newspaper today, but in St. John of Kronstadt’s lifetime, the American press was fascinated with him. Beginning in the early 1890s, St. John appeared quite regularly in US newspapers, complete with accounts of miracles (including even the raising of someone from the dead). But this Wilkes-Barre Times article stands out from all the rest. Here, you have one saint talking about another (a rare enough thing), and for a secular audience no less. LOL. Since she has been glorified as St. Elizabeth the Neo-Martyr, I think it is known.